Reviews of Science Fiction and Fantasy novels by Jessica Strider, a former bookseller and avid reader. You'll also find shout-outs to SFF books, medieval history reviews and tidbits and more. I worked at the World's Biggest Bookstore in Toronto for 10 years, until it closed in 2014. During my time there I planned themed endcaps and did author interview displays. From September 2010 until December 2012 I contributed book reviews and New Author Spotlight posts to SF Signal. From August 2013 to May 2014 I did a Recommended Reading with Professionals column there once or twice a month. I've got a BA in Medieval History from the University of Toronto. I'm an avid photographer and crafter, and started making my own greeting cards a few years ago. 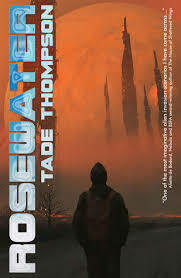 Tade Thompson's Rosewater is the start of an award-nominated, cutting edge trilogy set in Nigeria, by one of science fiction's most engaging new voices. Rosewater is a town on the edge. A community formed around the edges of a mysterious alien biodome, its residents comprise the hopeful, the hungry and the helpless - people eager for a glimpse inside the dome or a taste of its rumored healing powers. Kaaro is a government agent with a criminal past. He has seen inside the biodome, and doesn't care to again -- but when something begins killing off others like himself, Kaaro must defy his masters to search for an answer, facing his dark history and coming to a realization about a horrifying future.